On February 22, 2016, French Navy (Marine Nationale) aircraft carrier Charles de Gaulle left the Persian Gulf to sail back to the Mediterranean. U.S. Navy aicraft carrier USS Harry S. Truman took command on Febrary 14th of the naval forces in the coalition against Daech, the Task Force 50 (TF 50). The French Navy Carrier Strike Group crossing the Strait of Ormuz, on the way back. On 7 December 2015, while exiting the Suez Canal and entering the Red Sea, French Navy Rear Admiral Crignola took the lead of TF 50. A few days later, on 19 December, the Charles de Gaulle entered the Persian Gulf. The capabilities of the carrier strike group (CSG) then strengthened Chammal operation (the French contribution to Operation Inherent Resolve), responding to the decision to intensify strikes against Daech ordered by the French President. The integration of French and American naval forces allowed to strengthen interoperability between the two navies, thus demonstrating the benefit of years of interactions. This pooling of resources has led to several joint missions against Daech. 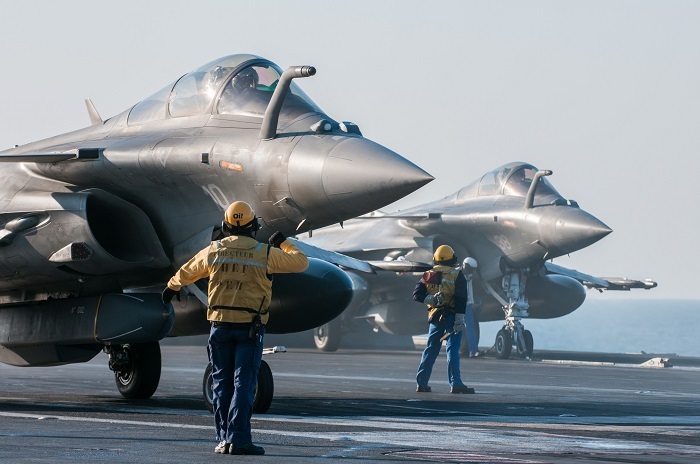 In recent days, the two CSGs conducted "dual carrier operations", that is to say the operations combining the resources of both French and American carrier strike groups. France taking command of TF 50 was welcomed by the American allies, particularly by Ashton Carter, Secretary of State for Defence and Vice Admiral Donegan, commander of the U.S. Navy Fifth Fleet. It was the first time this function was entrusted to a non-US admiral. Two French Navy Rafale M are launched (in bad weather) for a strike mission. The commitment of the French CSG within TF50 allowed to bring additional capabilities to the coalition. A fully fully interoperable intelligence platform was set up between the two navies. The results are thus measured also in terms of shared intelligence, improved situational awarness and force protection. After nearly two months, since its entry into the Gulf on 19 December 2015 until crossing the Strait of Hormuz on February 22, 2016, the crew of the Charles de Gaulle CSG led nearly 400 operational sorties. 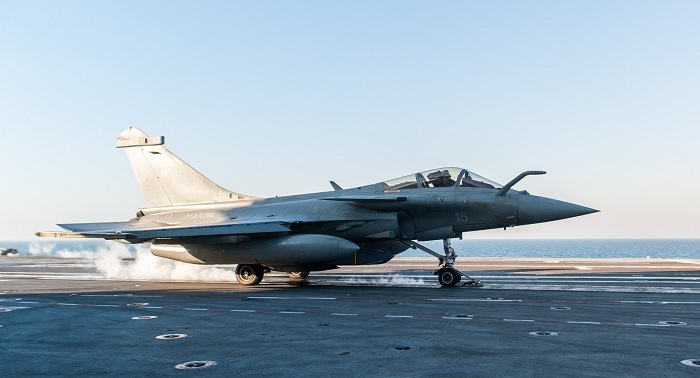 Integrated with the Chammal force, French Navy jets flew combat missions with French Air Force assests taking off from bases stationed in Jordan and in the UAE.. The CSG's aircraft conducted 23 ISR missions (intelligence surveillance and reconnaissance) above positions held by Daech in Iraq and Syria and conducted 80 strikes against Daech. After its departure from Toulon naval base on November 18, 2015, the Charles de Gaulle was immediately deployed in the Eastern Mediterranean. On 23 November, the carrier air wing led the first strike on areas controlled by Daech in Syria and Iraq. For 14 days, between November 23 and December 6, the CSG conducted 130 sorties, 22 strikes and 9 ISR missions over the territories controlled by Daech. Combining air power with that of the air force already in the reagion, the CSG has destroyed command and training centers, weapon storage sites and IED manufacturing facilities. It has also supported Iraqi forces fighting Daech on the ground in Iraq.